Firebird closed a deal with Activision/Electric Dreams which would see the budget publisher re-releasing a slew of older titles from the US for £1.99 each. No changes at Zzap! this month, though Julian Rignall got engaged to Glenys Powell, the “ever-effervescent” Editorial Assistant. Zzap! launched in Italy. Note the lack of “64” - Speccy, Atari, MSX and C16 gamers would all be catered for. The Sensi Software lads were wrapping up their next game: the awesome "Wizball”. Interesting that the news snippet makes mention of a “do-it-yourself” tune from Martin Galway? Palace’s rather nice looking sword fighting game "Barbarian" was about to hit the shelves. The head chopping action would commence next month. Compunet “legend” Ubik had written a compilation of four classic arcade games, namely “Space Invaders”, “Asteroids”, “Snake” and “Space Wars”. "The Big Four Pack"would be released by Firebird, who had also snapped up the rights for what would become one of the best coin-op conversions around: "Bubble Bobble”. "The Detective" from Argus Press would see the player attempt to solve an Agatha Christie style murder in a big mansion. I actually randomly played this the other day and was baffled… maybe next month’s review will help. Ocean had published Dinamic’s "Army Moves”. Production delays had kept Ariolasoft’s "They Stole a Million" from reaching retail, but those looked to be resolved. TV cartoon series "MASK" was getting the game treatment by Gremlin. 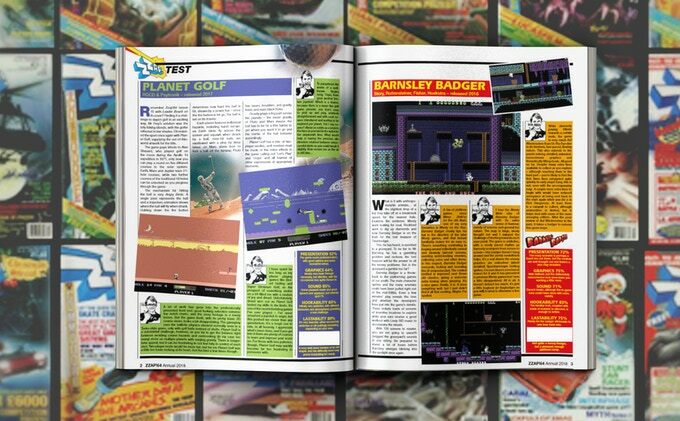 The team handling the development were the same ones responsible for the well received "Gauntlet" ports. The Sheffield based software house also had "Thing Bounces Back" and "Deathwish III" on the way. Andrew Spencer, creator of the absolute C64 classic "International Soccer" was back with "Street Sports Basketball”. Martin Sneap (aka MAT from Compunet) was handling the C64 conversion of "Shadow Skimmer”. Even though Jon Williams was still working on "Oink!" he had already begun to plan out his ”Knight Games" sequel. An interview with Douglas Adams about his recently released projects: a book called “Dirk Gently’s Holistic Detective Agency” and a new Infocom adventure, “Bureaucracy”. A comic that had started out as a fanzine a year earlier had ended up a surprise hit. Zzap! talked to two of “Oink!” mag founders, Mark Rodgers and Patrick Gallagher, as well as Jon Williams who had been tasked with bringing it to home computers. “Thalamusic” Rob Hubbard (Perhaps the highlight of the tape - a recording of the Sanxion loading music performed by Rob on actual synths). The developer diary of Andrew Braybrook’s "Morpheus" continued. This month saw him wrestling with artist’s block (unable to come up with any good sprite designs for the first 2-3 weeks), unreliable hardware and the details of the control scheme. "Gods and Heroes" Power House - 84% "An excellent platform game which offers plenty for those willing to perserve."